Not sure if this will be of any help, but I just crawled under my car on a very cold concrete floor (just trying to make you feel bad!!) 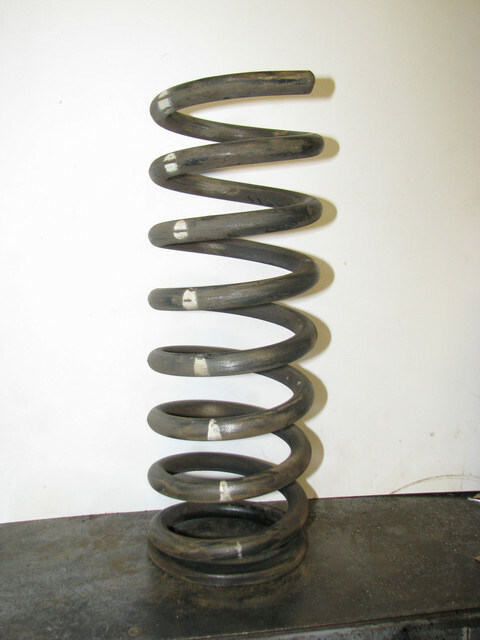 to measure the diameter of the wire on the stock Eaton Springs springs. It measured .650" and I know the free height is 15". I can't count the coils as it sit though. Somewhere amongst my pile of info, I have the Eaton's specs for the stock coil springs on a Mach 1 WITH comp suspension. Anyway I have a pic of the springs so that might help, but again these are Mach 1 with no A/C manual trans. (01-27-2019, 08:58 AM)Hemikiller Wrote: Wow - .715" wire diameter, no wonder the springs were so stiff. Can you also give me the OD of the spring itself? OD is approximately 5 3/8 inches. I wouldn't use the .715 number, I checked again this morning and never got that reading again, Old eyes and maybe wasn't holding caliper square. Going this morning to buy a digital caliber to double check and see it I can read it any better! If anything jumps up significantly different I'll let you know. Anyway, any wire over .70 explains a lot doesn't it. Just re-measured with a digital caliper and it reads 0.72 for wire diameter, 5.34 OD and approx 3.88 ID. Cheap Harbor Freight Digital caliper but supposed to be accurate to 0.01. So it's even bigger wire diam. than you thought! If I recall, those SD springs I got with the "kit" were about .600 dia. wire and were about 17" tall, uncompressed. Actually, I think they might have been for an earlier car, like a 67. I know I thought wow, why so tall, but maybe they are softer and will settle at the right height. I was wrong on that score. Thanks for your help. It didn't matter much to me what the rate was, I just knew they were way too stiff!! Just glad to know what it turned out to be so next time I see an add for springs, I'll know what to stay away from. Interestingly, I ran similar shock/spring combo on a 68 Shelby with an old school 427FE and it wasn't a problem. Lots of weight on the nose and fastback was much more rigid than my convertible. Anyway, I'm glad to have them off. Guess I owe an apology to Scott Drake for selling exactly what they said they were.